Apple changed a lot with the release of iTunes 12, including the steps on repeating songs or playlists. Follow these steps if you need to learn how. While in iTunes, press the “ALT” key, then select “Controls“. 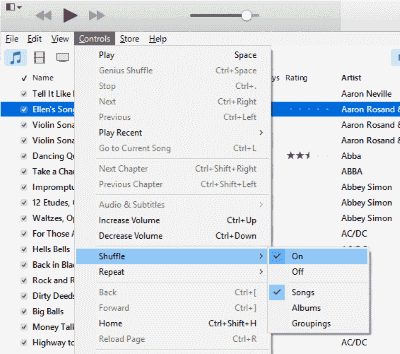 Choose “Shuffle” or “Repeat“, then choose the desired setting. Now, while playing a song, you should see the shuffle and repeat options respectively to the left of the Now Playing area. Click these icons to activate and deactivate shuffle and repeat. When lit in blue, they are activated. When black, they are disabled. You can also right-click or control-click the icons to show the options. Dark arrows means that repeat is completely disabled. Blue arrows, and the entire current playlist you are playing will be repeated. Blue arrows with a number 1 next to it means the current song will be repeated. Thank you for this easy to read, simple guide. I was restlessly upset with iTunes for not shuffling how I wanted it to. I can’t get shuffle to turn OFF on my iPhone 6 Plus. As a classical music person, I never, ever want shuffle. It’s driving me crazy. Any ideas? Thank you for this post. I have gone through the steps and hopefully I will now shuffle and repeat. However, I don’t get the REPEAT, or SHUFFLE icons, like I used to when I go to the mini player. Any suggestions? I tried the suggestion and still, on my iPhone6, Playlist songs will not shuffle. I tried asking Siri. She repsonded with “OK, turning on shuffle” – songs still would not shuffle. The shuffle icon is available on each Playlist – but when I tap it, the songs still will not shuffle.